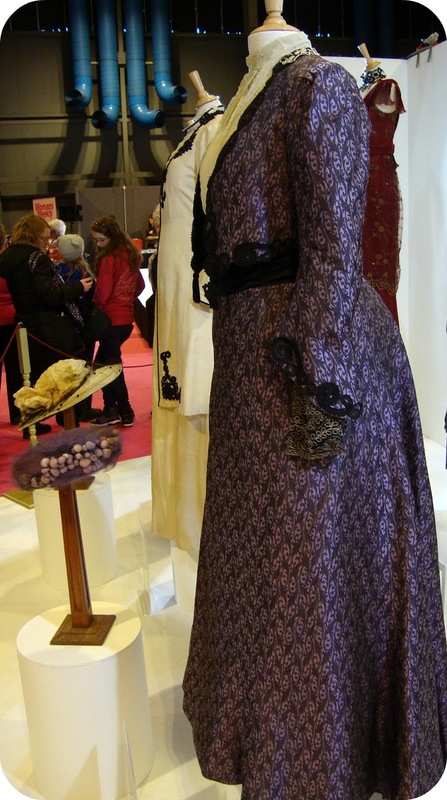 Thanks for sharing these photos from the Downton exhibit! I was wondering, Debi, if you might be willing to offer some suggestions on places to go in Endiburgh. My husband and I are taking a trip in May, and I'd love to have some insider information! Violet is also my favorite character, I think because she is such a character! Thanks so much for sharing the photo's. Somewhere, deep in my closet, I just remembered that I have a charming little (and I mean little) blouse that reminds me of the neckline gathering on this one. Am I the only one who holds on to special pieces of clothing that will never, ever fit again? Such a beautiful suit. I need to watch this show! I feel like I am missing out on so much! 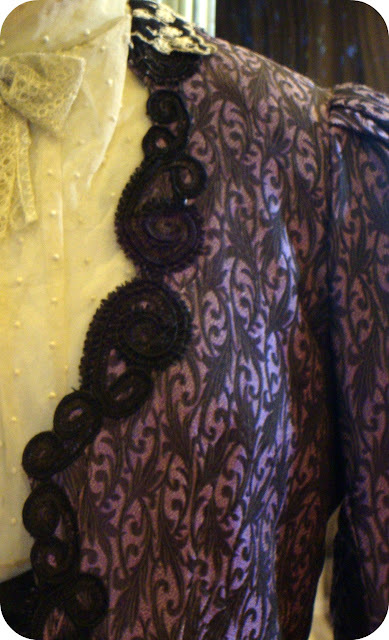 Did you get to see the fabulous lace duster jacket that Violet wore? I'd LOVE to see details on that...and Thanks for sharing these pics!!! 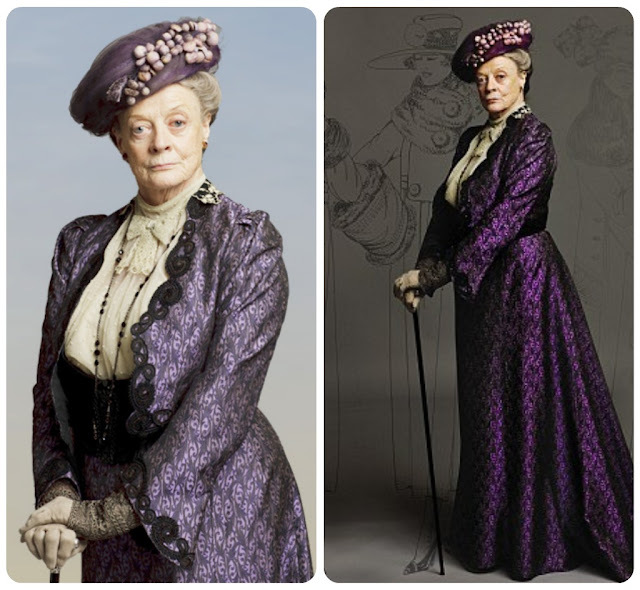 I am so happy that you are sharing these photos :) This is one of my favourite Dowager Countess' outfits and I am looking forward to seeing close ups of Cora's coat. I suspect it's not a full blouse. It was typical in the era to do a false front and given the difference in front and cuffs, this would be a likely candidate. It's gorgeous isn't it. I have some braid very like the black, in a pale creamy gold metallic thread. Those gold lace undersleeves are either attached to the inside of the jacket sleeve, judging by the way they are sitting, or to an undersleeve of something else that stops above the visible line of sight. On my wedding dress, I attached half length undersleeves to the sleeve lining at the elbow. I'm looking forward to seeing more close-ups like this. 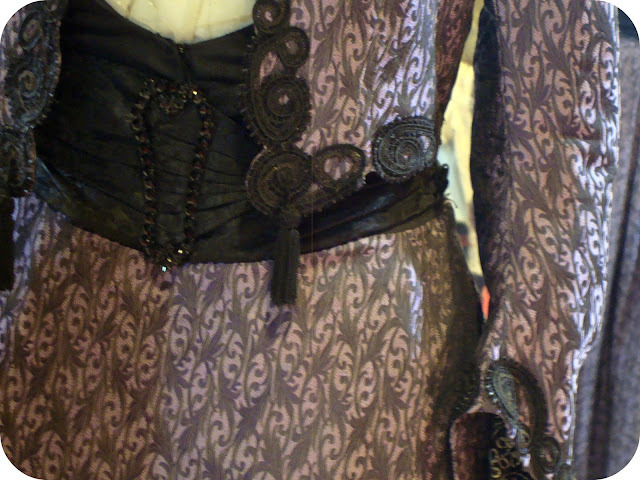 Who doesn't love construction details of fabulous costumes? Although I'm no expert, I have some theories about the outfit. 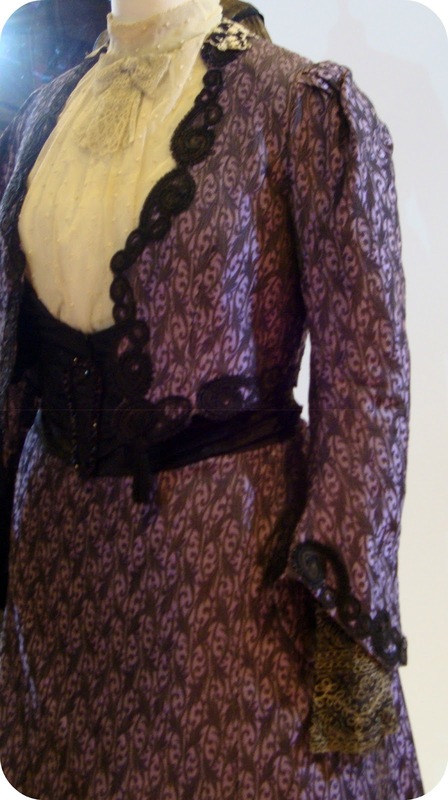 I agree with Anne Foster about the blouse: both false fronts and separate cuffs were common at the time, so it's likely that those aren't connected. 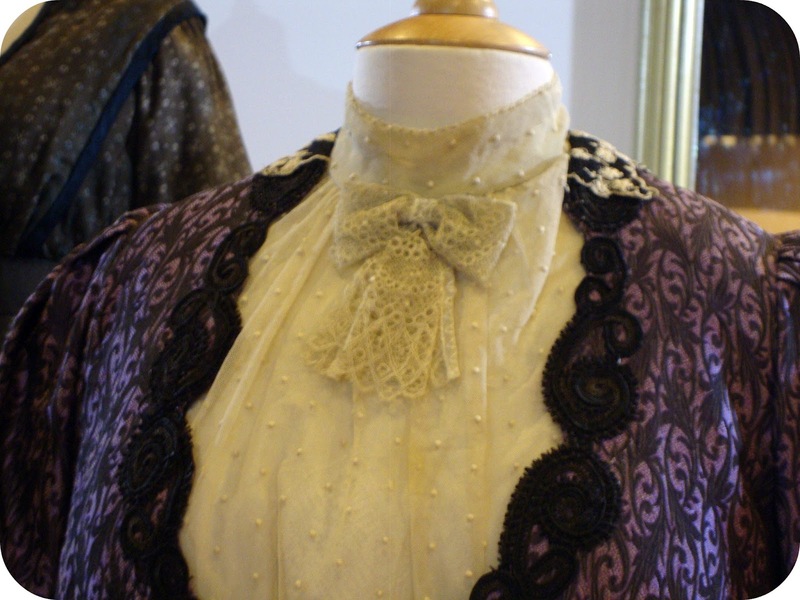 It seems like the sort of blouse (or combination of blouse-like elements) which was always worn under something, so the covered parts of it are likely to be much more plain. And I think you are right about the cumberbund have a hidden closure with hooks and eyes. After all, because an outfit like this would be made-to-measure and fitted over a corset, one didn't need a belt te be adjustable. The hat decoration looks to me to be some sort of artificial grapes, perhaps of silk chiffon in several colors layered, made up simply by gathering edges of a circle of fabric and stuffing quite firmly to achieve a little globe. 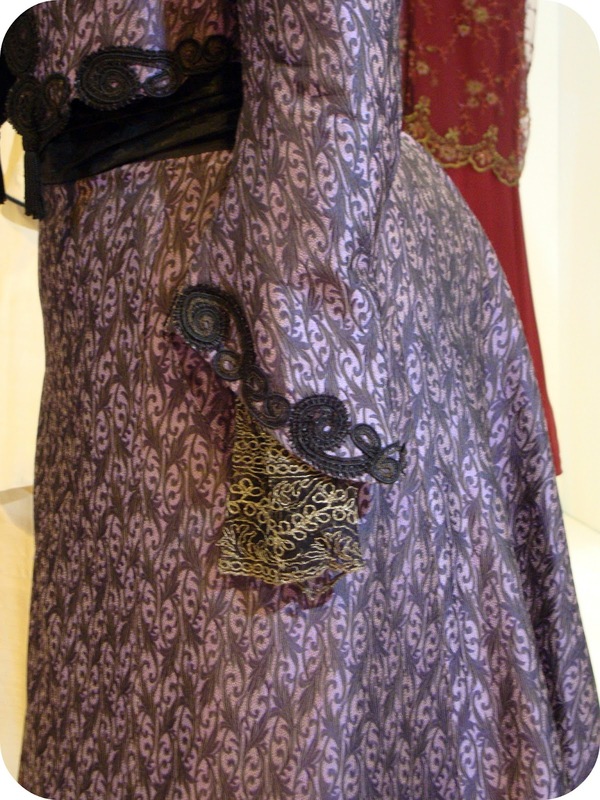 Blouse cuffs would have been the only embellished bit, as the rest of the sleeve is hidden by jacket sleeve ( blouse would not have been worn without jacket in public by someone of this social stature). It is even possible that the cuff is part of a partial false sleeve attached to the bottom of the jacket sleeve; and that the blouse body is merely a front and back joined at the shoulder, tying at the waist (a sort of dickey). This reduced bulk under a jacket. The half-blouses were easy to wash. You could have a whole wardrobe of half-blouses for each suit, to change up the look of the suit. What I love best about this particular suit is the shape and length of the jacket's sleeves and then the longer blouse sleeves. 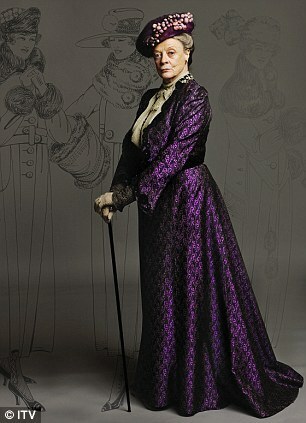 And who doesn't love Maggie Smith as Violet?!?!?! She brings so much to the show. I have to agree, I think she might be my favorite character as well! She keeps it real. I read on the Daily Mail that some of the cast hasn't signed on for the 4th and 5th season yet and that included Maggie Smith! I got a bit panicky, I hope we don't have another Mad Men situation and that they all reach an agreement. I do that too! I've got a few pieces that I'm still holding onto! So true! I like the idea of the false front...at least it would be a bit cooler in the summer months! I love this sort of thing too! hahahaha...so true! Her one liners are fabulous! Thanks LinB! That makes a lot of sense about the half-blouses and the versatility for changing up a suit like this! And really fascinating about the hat trim. Oh no!!! I hope she signs on! At the pace it's going would the 4th season be in the 30's and the 5th in the 40's??? Soon they'll catch up with Mad Men in terms of decades! 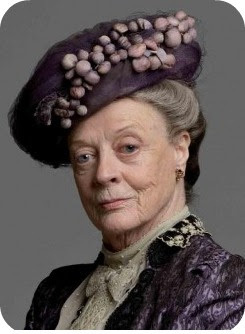 Ah, the magnificent Maggie Smith, she's so wonderful. 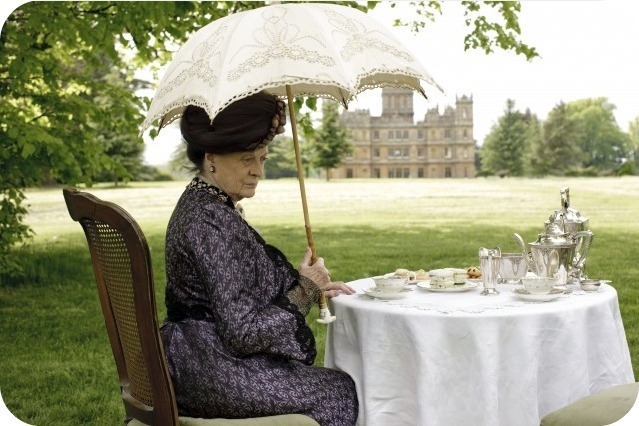 Will you ever forgive me if I admit I'm yet to start watching Downton Abbey? I've been meaning to for ages but I'm more inclined after seeing my surname pop up in all these posts all the time (and a little freaked out I have to confess). The costumes look so amazing, I've watched worse for less! Dover Books reprints lots of old fashion plates. In "Victorian Fashions & Costumes from Harper's Bazar, 1867-1898," ISBN 0-486-22990-4, pp 245-247 have illustrations of undergarments common to the late 1890s. The half-shirts are called "chemisettes." 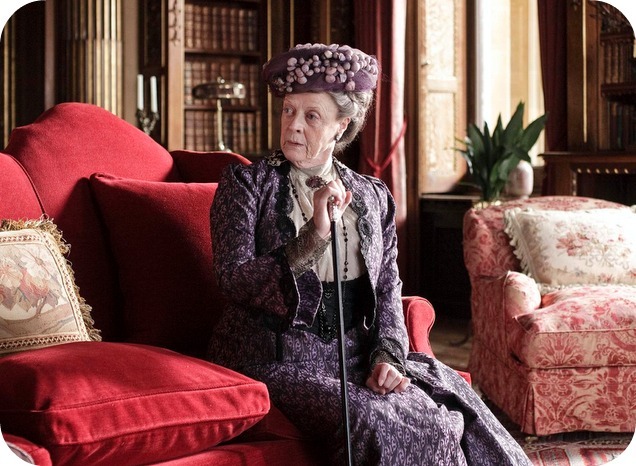 Violet's suit is of a style from that era: older people often wear clothing styles popular in their youth. (Seeing a woman wear a suit 20 years out of date is not uncommon in our own time!) Folkwear patterns has a good example of the skirt in this suit. They call it a "walking skirt." Why not? Isn't there a whole genre of life-choices called "steam punk?" You'd not look out of place in a suit like this in most major metropolitan areas, if you used a plainer fabric and shortened the skirt a bit. the decoration of her hat is net or some type of fine silk chiffon which is wrapped around bits of stuffing or padding or stuffing.